French police questioned and released the suspect at the centre of an international manhunt hours after the Paris attacks, according to officials. He was one of three people in a car stopped by police on Saturday morning, hours after the attacks that left at least 129 dead, the officials said. Three French police officials and a top French security official confirmed that officers stopped Abdeslam and checked his ID and then let him go. 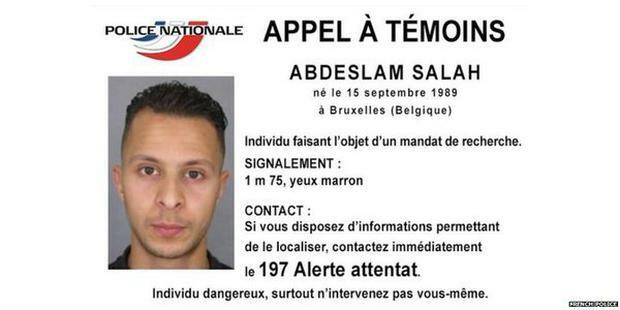 Earlier tonight, French police issued a wanted notice with a photo of Abdeslam, who is thought to be on the run after being involved in the Paris attacks. The manhunt has been launched for Salah Abdeslam, a 26-year-old born in Belgian capital Brussels, warning people that he is dangerous and saying "do not intervene yourself". In the meantime, more details have emerged about the Islamic State (IS) attack which was the worst terrorist outrage in Europe for more than a decade, leaving at least 129 dead and 350 wounded. :: Seven people were detained in Belgium in connection with the attacks. :: Two of the terrorists killed on Friday night were Frenchmen living in the Belgian capital Brussels. :: As many as three of the seven suicide bombers were French, as was at least one of the men arrested in Belgium. :: Three Kalashnikov assault rifles were discovered inside a Seat car used in the attacks which was found in the suburb of Montreuil, four miles east of Paris. :: Mostefai's father and brother have been arrested. :: Prosecutors believe three teams of terrorists carried out the co-ordinated attacks. :: At least one of the attackers is believed to have passed through Greece as a refugee.